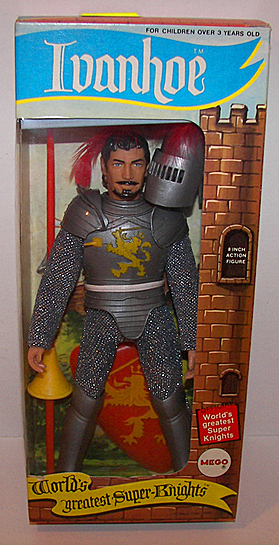 Description: Here is a Mego 8" scale Worlds Greatest Super Knights Sir Galahad MINT IN BOX. This is NOT a recent reproduction. Figure, insert and box are guaranteed 100% ALL ORIGINAL 1970's Mego. The figure is complete, dead mint, never removed from his box. ALL parts, accessories are intact. The vintage Mego box is also in mint/ unplayed with condition, a rarity to find in this type of condition these days. No shelf wear with bright vintage colors on ALL panels. ALL tabs and flaps intact. Nice 90 degree panels all around. Vintage price tag on bottom panel. Clean and pristine. Original cello window is completely factory attached to the box. Window is clean and clear as seen in the pics. Original insert appears perfect and nests the figure well with his feather and helmet fixed inside. Here is your chance to grab a super RARE Mego collectible from the 1970's in perfect condition. You will never have to upgrade. Worlds Greatest Super Knights Sir Galahad MINT IN BOX! 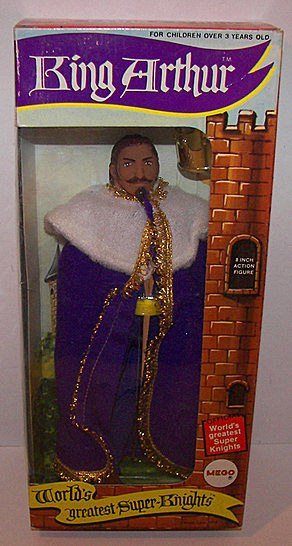 Description: Here is a Mego 8" scale Worlds Greatest Super Knights Sir Launcelot MINT IN BOX. This is NOT a recent reproduction. 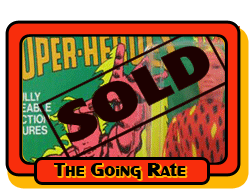 Figure, insert and box are guaranteed 100% ALL ORIGINAL 1970's Mego. The figure is complete, dead mint, never removed from his box. ALL parts, accessories are intact. The vintage Mego box is also in mint/ unplayed with condition, a rarity to find in this type of condition these days. No shelf wear with bright vintage colors on ALL panels. ALL tabs and flaps intact. Nice 90 degree panels all around. NO price tags. Clean and pristine. Original cello window is completely factory attached to the box. Window is clean and clear as seen in the pics. Original insert appears perfect and nests the figure well with his feather, helmet and shield fixed inside. Here is your chance to grab a super RARE Mego collectible from the 1970's in perfect condition. You will never have to upgrade. Worlds Greatest Super Knights Sir Launcelot MINT IN BOX! 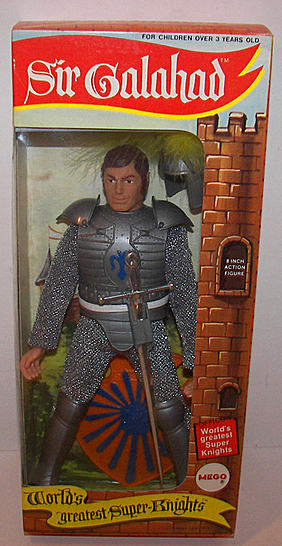 Description: Here is a Mego 8" scale Worlds Greatest Super Knights Ivanhoe MINT IN BOX. This is NOT a recent reproduction. Figure, insert and box are guaranteed 100% ALL ORIGINAL 1970's Mego. The figure is complete, dead mint, never removed from his box. ALL parts, accessories are intact. The vintage Mego box is also in mint/ unplayed with condition, a rarity to find in this type of condition these days. No shelf wear with bright vintage colors on ALL panels. ALL tabs and flaps intact. Nice 90 degree panels all around. Vintage price tag on top panel. Clean and pristine. Original cello window is completely factory attached to the box. Window is clean and clear as seen in the pics. Original insert appears perfect and nests the figure well with his feather, helmet, shield and jousting spear fixed inside. Here is your chance to grab a super RARE Mego collectible from the 1970's in perfect condition. You will never have to upgrade. Worlds Greatest Super Knights Ivanhoe MINT IN BOX! 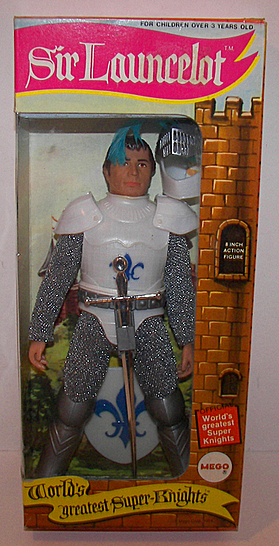 Description: Here is a Mego 8" scale Worlds Greatest Super Knights King Arthur MINT IN BOX. This is NOT a recent reproduction. Figure, insert and box are guaranteed 100% ALL ORIGINAL 1970's Mego. The figure is complete, dead mint, never removed from his box. ALL parts, accessories are intact. The vintage Mego box is also in mint/ unplayed with condition, a rarity to find in this type of condition these days. No shelf wear with bright vintage colors on ALL panels. ALL tabs and flaps intact. Nice 90 degree panels all around. No price tags. Clean and pristine. Original cello window is completely factory attached to the box. Window is clean and clear as seen in the pics. Original insert appears perfect and nests the figure well with his crown fixed inside. Here is your chance to grab a super RARE Mego collectible from the 1970's in perfect condition. You will never have to upgrade. Worlds Greatest Super Knights King Arthur MINT IN BOX!